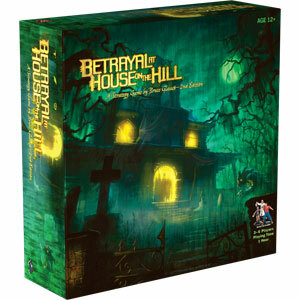 Avalon Hill (aka Wizards of the Coast, aka Hasbro) has republished the classic 2004 haunted house game with some new features. Just having it back in print is a fairly big deal, since I’ve seen copies of the original going for as much $150. The game appears to be largely the same, with new haunts and items, as well as some redesigned tokens. Out of the the box, this one looks good. There are clear similarities to the Castle Ravenloft Board Game, with players “building” the house by laying down tiles as they explore. Once someone triggers a “haunt,” one player becomes the traitor and the game turns into a fight against a diverse array of creatures. There’s even a werewolf haunt that has the traitor infecting the others. I have a giant stack of games waiting for their turn at the table, so a full review will have to wait, but after a read-through of the rules and a general fondling of the components, it looks promising. Go ahead, laugh, but this looks like a great one for the kids. Good games for young kids aren’t all that common, so it’s nice to see a branded product with this level of quality. This follow-up to Scooby Doo: First Frights it pretty simple, and has a bit too much traveling back-and-forth, but it’s well animated, has excellent sound (except for a regrettable decision to include a laugh track) and good content thus far. A new Kindle is supposedly on its way, and I’m planning to see how well the new games work on it. I’ve gotten a look at a couple of free games, Every Word and Shuffled Row, and I’m kind of impressed they could pull it off. 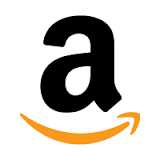 I’m a huge fan of Kindle, but I don’t think “game platform” when I see one. Cut the Rope is one of the best puzzlers to hit the App Store in a long time. If any game has the potential to knock those Angry Birds off their perch, it’s this one. The gameplay is based on an old physics-puzzle standby. Hanging objects function like pendulums, and you need to cut the ropes at precisely the right time and in exactly the right sequence to get the object where it needs to go. In this case, the problem is how to get a piece of candy into the mouth of a voracious (yet adorable) little monster. The puzzles start out with a single element: a piece of candy dangling from a rope. It’s directly over the monster, and a line of 3 stars are right below it. Cut the rope with a finger swipe, and the candy collects the stars as it drops into the monster’s mouth. The puzzles quickly add both complexity and new variables. Stars are spread around, multiple ropes are attached, and solutions become part logic and part dexterity. Bubbles lift the candy up, whoopee cushions push it around, new ropes pop up, and movable pivots allow you to shift the rope. Meanwhile, spikes, electrodes, and spiders appear as hazards. Every time you think you’ve got the game figured out, it adds some new and inventive element. There are 4 sets of 25 puzzles each, with more to come. Each puzzle has one basic requirement for victory: get the candy in the monster’s mouth. The tricky part, however, is to do so while collecting all 3 stars on every screen. Merely getting the candy where it needs to go isn’t that hard, but you’ll want to keep trying until you figure out how to pull it off while getting all 3 stars. 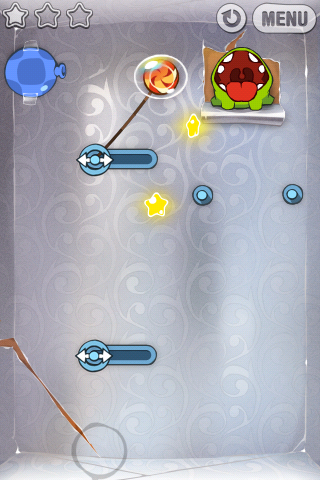 Like Angry Birds, Cut the Rope is from Chillingo. They obviously have a knack for combining excellent character and art design with horribly addictive gameplay. Get used to the sight of that little bug-eyed monster, folks: he’s going to be sitting on the top-10 list for a long time.